Hello new friends! My name is Elisha from PneumaticAddict.com and I'm new around here. I'll be contributing cool DIY projects and trying to turn you all into Master Builders. Like my buddy Kim, I'm a girl who loves her power tools. You can usually find me in the garage, covered in sawdust or creating new, free building plans to share on my site. I'm a not a woodworker. Woodworkers spend 2 weeks carving a jewelry box out of rich mahogany. I buy a couple sheets of plywood and build a set of modern bunk beds for my twins. I love to make all kinds of cool things and I'm not too big of a snob to use 2 x 4's. Grandpa was a woodworker though, and a dang good one. He made hand turned, hardwood bowls that were absolutely gorgeous! My grandpa created some of the most beautiful things out of wood and was well known in our town for his workmanship. Unfortunately, Alzheimer's had a tight hold of Grandpa by the time I discovered my love for building. I hesitate to show my work to family members because they often get teary eyed and tell me "how proud Grandpa would be" - which makes me get all teary eyed too. My grandpa loved to make wooden toys! My boys still play will a set of checkers I inherited as a small girl. I want to make fun little things that my grandkids with play with, but since I'm not a "real woodworker" I have to get creative. 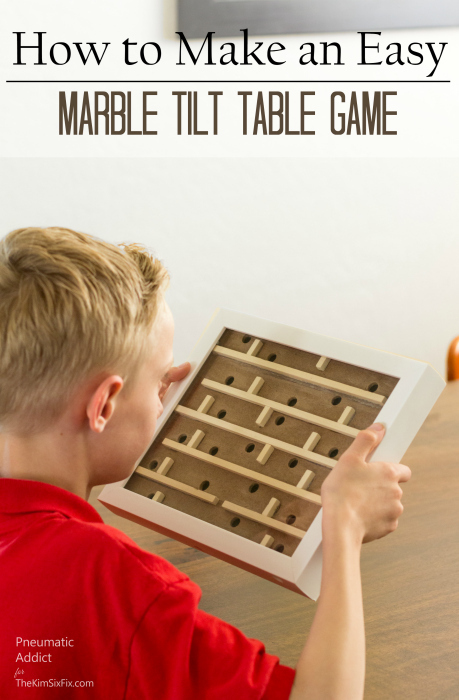 I came up with a Marble Tilt Table Game using an off-the-shelf shadow box frame. Aside from the ball bearings (which were $0.14 at Ace Hardware), I found all my supplies on sale at Joann's for around $16. If you're more the Amazon type, I've provided affiliate links (*) below. 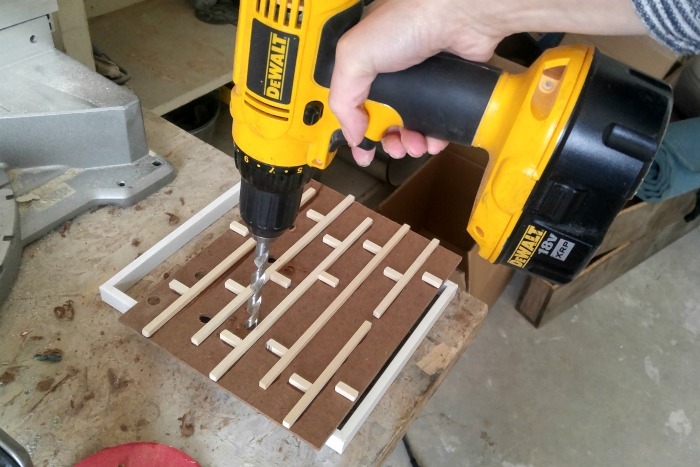 (4) 1/4" dowel @ 9-1/4"
(2) 1/4" dowel @ 4-3/4"
(14) 1/4" dowel @ 3/4"
(2) 1/4" dowel @ 8"
(2) 1/4" dowel @ 9-1/2"
1. 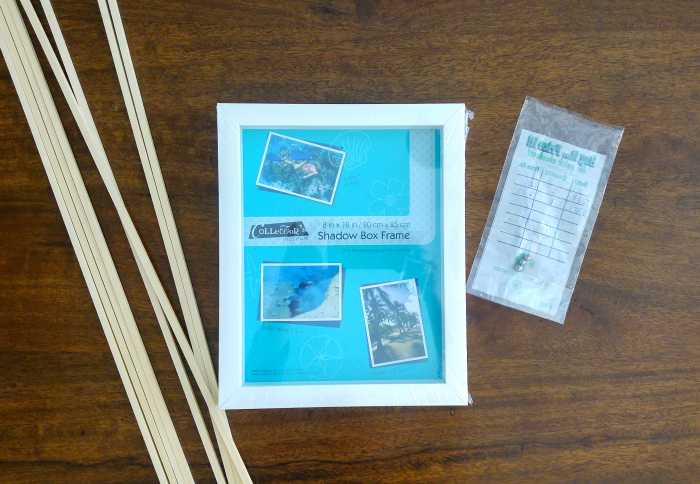 This tutorial calls for an 8" x 10" shadow box with a 3/4" deep cavity, which appears to be a pretty standard size. 2. First, pry open the little tabs in back and remove the backer board. 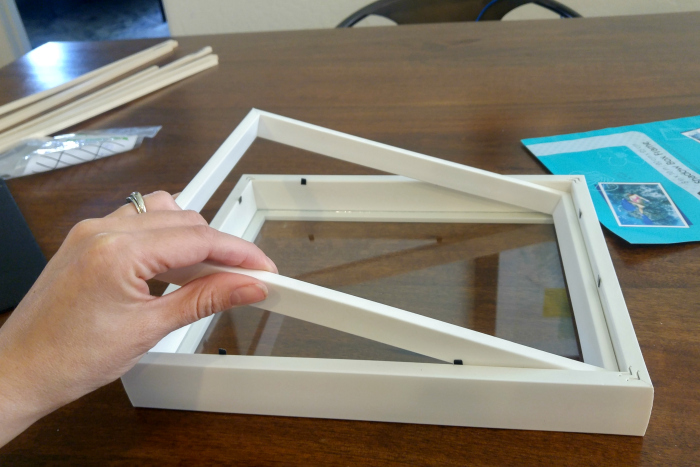 Then, pull out the liner frame; You won't need it. 3. 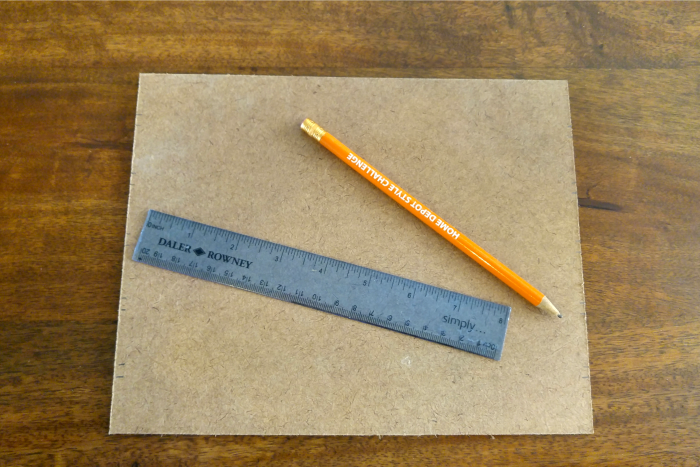 You will need to purchase or cut a piece of 8" x 10" x 1/8" chipboard, MDF, or foamcore. 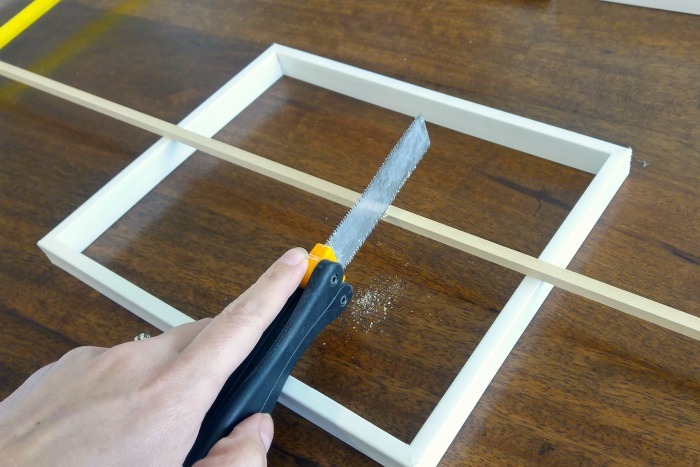 It's the exact size of a picture frame backer board, so you can steal one from an old frame like me, or you can buy one pre-cut in the framing section of the craft store. 4. The next step is to use a pencil and ruler to draw the lines where your stiles and rails will go on your game board. Because I'm a nerd, I sketched up a diagram for placement. Feel free to print this image out (make sure it's to scale) and use it as a template for your board. 5. 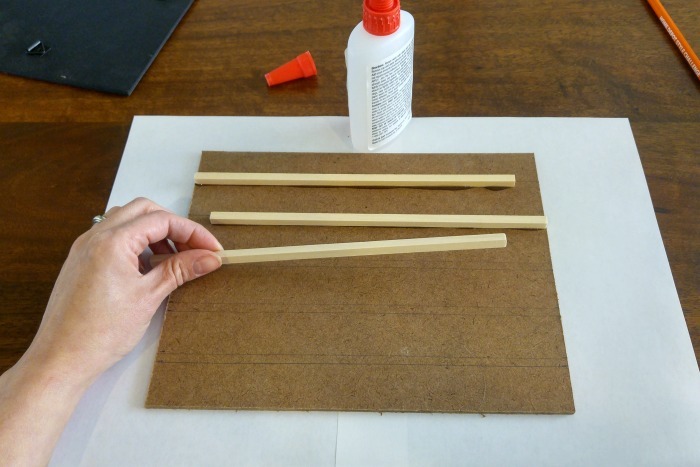 Mark and cut the 1/4" into pieces using a small hand saw. I found the discarded liner frame made a nice little platform to cut on. Sand any rough or sharp edges. 6. 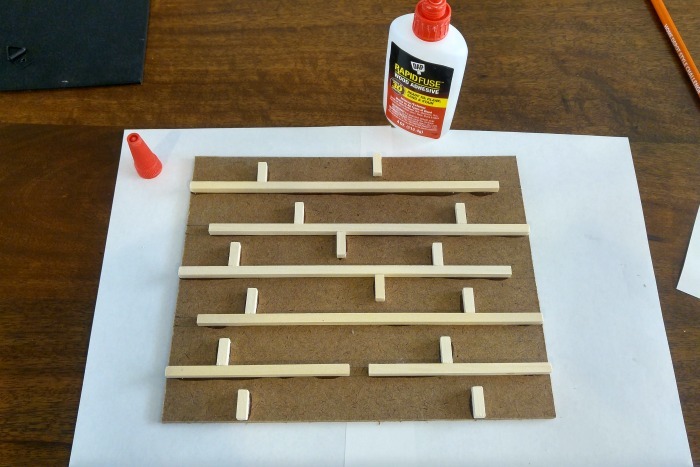 Using a *quick setting wood glue, start attaching the horizontal rails over the penciled lines, alternating which end is flush to the edge. 7. Next, add the vertical stiles tightly against the rails. 8. 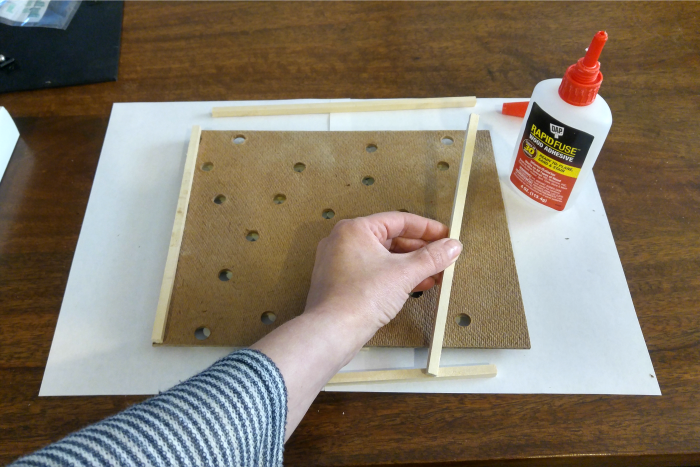 Once the glue has dried, use a 3/8" drill bit to create holes in the designated positions on the game board. Make sure the holes are flat and smooth so the ball will roll easily. Sand the edges if needed. 9. 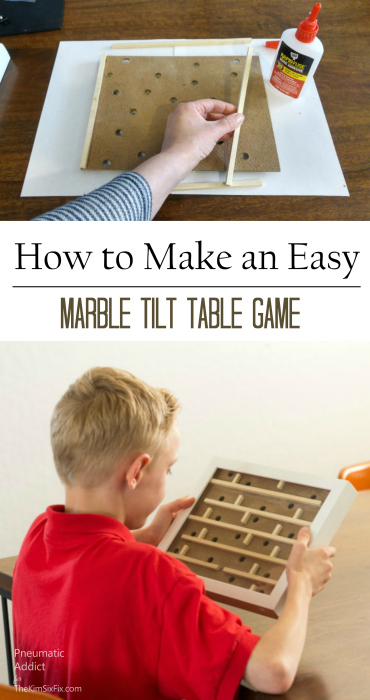 Flip the game board over and glue 1/4" riser pieces around the perimeter. Glue the original backer board that came with the frame on top of the risers. 10. 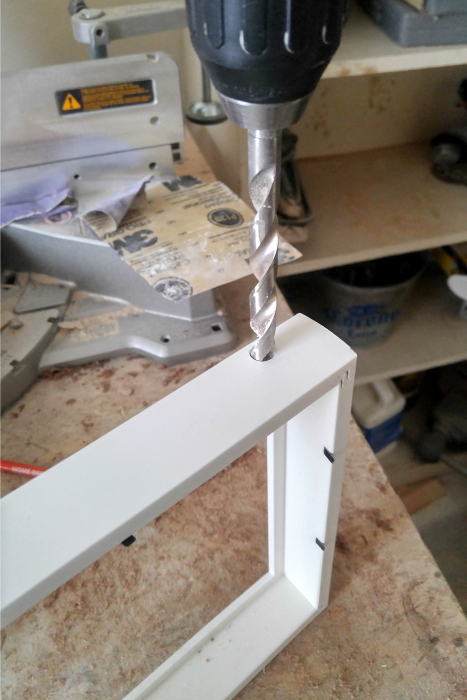 You need a place for the ball bearing to enter the maze and exit, so drill an additional hole in the "start" corner, as well as the "finish" corner of the frame, about 1/4" inch from the top edge. 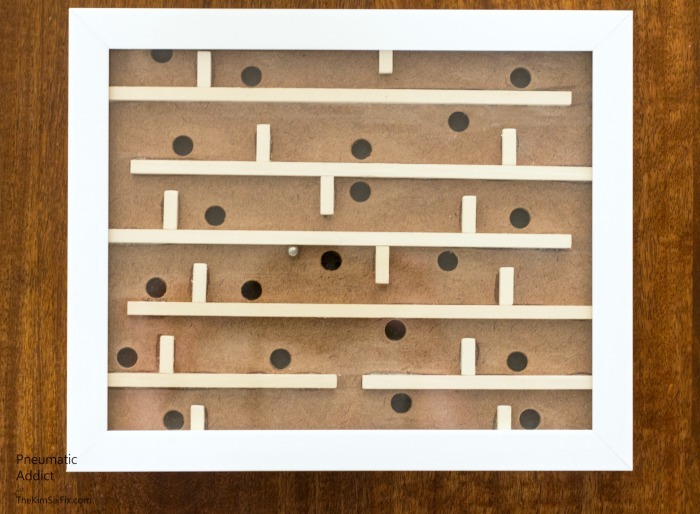 You may chose also drill a hole in the backer board or bottom-center of the frame as a release hole to retrieve the ball if you have an "oops" and fall through the board. 11. 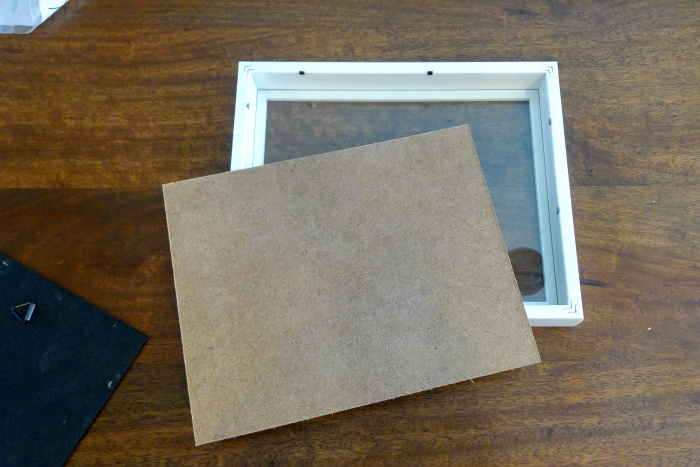 The last step is to drop the game board with attached backer into place and bend the tabs closed. That's it. 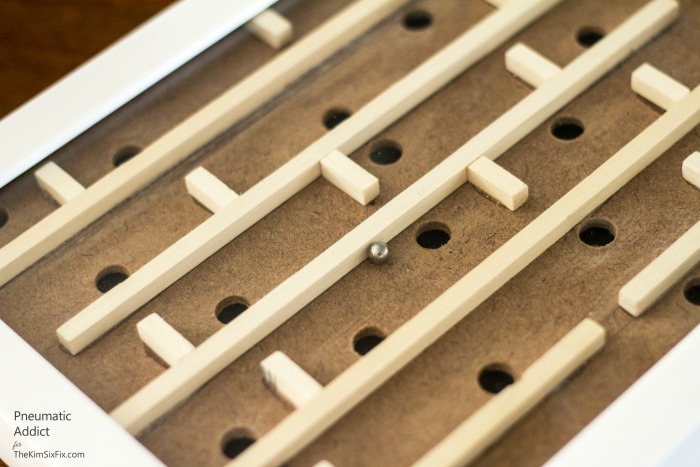 Drop in a ball bearing and you're ready to play! My boys had tons of fun playing, avoiding the holes. I wouldn't recommend letting small children play unsupervised since there are glass and small chokeables involved. A handmade game would be an awesome Father's or Mother's Day gift though. I thought about painting the game board, but fell in love with the neutrality of the bare wood. If you were fun and crafty, I bet you could come up with a fun design. Did you like this idea? I'll be back again soon to share another cool DIY project. 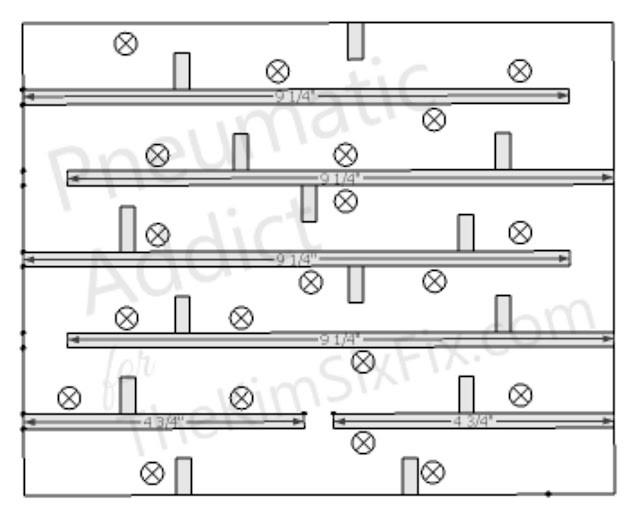 In the meantime, check out PneumaticAddict.com and pin the image below to save the idea for later!